Buzz Lightyear, the animated spaceranger who, in action figure form, flew to the International Space Station(ISS) in 2008, now has an official mission patch courtesy of an11-year-old artist. Adam Carr of Tampa, Florida wasannounced Tuesday as the winner ofthe Walt Disney Company's "Mission Patch Design Challenge" thatinvited elementary school students to design an emblem for the12-inch Buzz Lightyear's 468-day stay aboard the orbiting outpost. "Adam says he dreams of one day becoming anastronaut and hopes his design will inspire others to reach for thestars," wrote Thomas Smith, Disney Parks' social media director onthe company's blog. "Congratulations, Adam." Carr's blue and yellow design features ahand-drawn and colored depiction of the cartoon character soaring forwardfrom the space station as the trail from the STS-124 and STS-128orbiters that took him to and from space create the patch's border. The contest extended an educationalpartnership between Disney and NASA that began with Buzz Lightyear'sflight aboard the ISS. While there, NASA astronauts filmed the figuretaking part in basic science demonstrations for later use in classrooms onthe ground. NASA, which is currently holding a similar contest among itsemployees to design an insignia for the upcoming end of its space shuttleprogram, will fly Carr's Buzz Lightyear patch on one of the finalfive missions for the orbiter fleet. 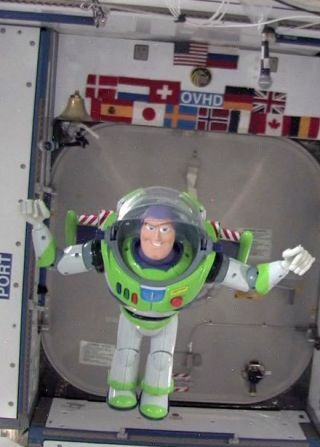 "After the mission, he will get the patchwith a certificate from NASA and Disney Parks," wrote Smith. According to the contest rules, Carr and up tothree of his family members will also receive a four-day, three-nightvacation at Walt Disney World, in addition to a tour of the KennedySpace Center in Florida. The contest, which ran from Oct. 2 through Nov. 6,2009, saw "many unique and creative submissions" according to anupdate posted on NASA's website. An exact number of entries was notimmediately available. Buzz Lightyear is not the first 'animatedastronaut' to be depicted on a NASA-launched patch. Other cartoonsthat have graced space project patches include Looney Tunes' DaffyDuck and Marvin the Martian, Snoopy, the Teenage Mutant Ninja Turtles andHomer Simpson. A second NASA student contest, announced on thesame day as the Lightyear mission patch challenge continues to acceptsubmissions. The "Kids In Micro-g!" program asks children ingrades 5 through 8 to develop an experiment or demonstration forastronauts aboard the space station to perform. The deadline for thatchallenge is Feb. 19, 2010. Visit collectSPACE.com to see thewinning BuzzLightyear patch, and while there votefor your favorite of NASA'send-of-shuttle commemorative emblems.